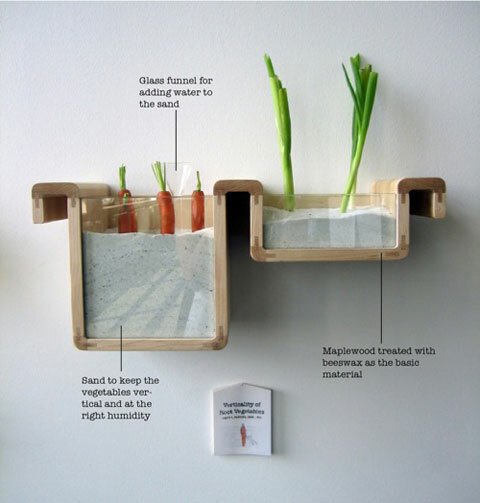 Korean designer Jihyum Ryou has reimagined the idea and practice of food storage without using a fridge. “Save Food From The Fridge” is a project that aims to utilize traditional word-of-mouth knowledge of food and every day objects to preserve food in an eco-friendly way. “Observing the food and therefore changing the notion of food preservation, we could find the answer to current situations such as the overuse of energy and food wastage” Ryou wrote on his website. Using the knowledge of food properties and how certain foods interact with one another, Ryou has created an alternative way of storing our food; which makes us re-evaluating traditional methods of food storage. Refrigerators are the largest power-guzzling appliance in the typical household. If the fridge is from the early 90’s, chances are it’s using 2-3 times as much energy as current models. This appliance may account for 1/5 of an average households annual electricity costs. I’m not sure how practical and feasible Ryou’s design is but I think it is a step in the right direction. He is questioning modern “traditional” methods and looking for better alternatives. This design makes me wonder where the ice cream and milk should be stored? This design would work for an extremely green household, who would likely not consume ice cream and would milk their cow/goat for dairy daily.